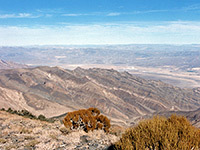 Because of the effects of geological faulting, the Panamint Mountains along the west side of Death Valley are generally several thousand feet higher than the Amargosa Range to the east, and one of the top six summits is 9,046 foot Wildrose Peak. This is reached by the scenic, deserted Emigrant Canyon road, which winds its way along the west side of the mountain range into the Wildrose foothills, and then by a steep but relatively easy 4.2 mile trail that climbs to the top - a great viewpoint from which many miles of basin and range country is visible. Wildrose Peak Trail topographic map. The path starts near the end of the approach road, 1.5 miles after the end of the pavement, and next to the Charcoal Kilns. 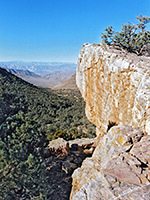 It quickly gains height, and provides good views over the upper end of Wildrose Canyon, and of distant, hazy hills to the south. After less than half a mile the route turns a corner and heads directly up the valley, through a quite densely wooded landscape of pinon pine and juniper trees. The trail is not too steep until at the end of the canyon, where it climbs quite sharply up to the top of a ridge. Death Valley comes dramatically into view after a few hundred yards through flattish land - the trees open out, and 1.5 miles below lie the extensive white salt flats around Badwater. The trail turns north, remains flat for a while and then is steep once more. The land becomes rockier and more open as the summit approaches. The last half mile is very steep, with numerous switchbacks. 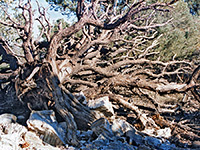 The trees die out and the very top is quite bare - just weathered rocks with a few small bushes, grassy patches and scattered cacti. The valley floor is now hidden by promontories and by several side canyons with colorful, extravagantly layered rocks. The view, though, extends in all directions including south along the course of the valley 80 miles to Baker, and west to the Sierra Nevada Mountains. On a perfectly still, cloudless day in December, the 8.4 mile round trip took less than 3 hours. The temperature around the high elevations was in the 40s, but the air felt pleasantly warm due to the complete absence of wind, even on the summit. There was absolute silence on the whole journey - quite a moving experience.